Are you in the market for gear for your Alaska adventure? Have a look at our Gear Review pages for reviews on specific products that have made it to the top of our list! Check out the following overviews if you need a general orientation to the principles involved, but for more detail and specific brand recommendations click the title of the category. For discussion purposes we are separating personal gear and community gear. Personal gear includes mostly what you wear, or items that are not normally shared between members of a group. The old saying that "cotton kills" is no more true than in Alaska. Cotton clothing is comfortable, however when it becomes wet it absorbs water, mats down and not only loses its thermal efficiency, it actually wicks heat away from your body by evaporation. Look for quality synthetic materials instead. Wool also has its fans, but it gets heavy when wet and can take considerably longer to dry than synthetics. Regardless of what kind of trip you are taking, you should always bring rain gear of some kind. The weather in Alaska is highly variable, making it impossible to plan on dry sunny weather all the time. Besides the different configurations (bibs, rain pants, parka jackets, short jackets, ponchos, etc. ), there are different materials. Some brands bill themselves as "breathable", but as many have discovered, they eventually leak along the seams. Don't be fooled by one or two trips with this stuff; breathable raingear seams break down over time, and sometimes that means two or three trips and you're leaking. The other option is to go with a light-weight, 100% waterproof shell. Almost all experienced outdoorsmen in Alaska use waterproof shells instead of the breatable fabrics. Any trip involving fishing or hiking requires waterproof footwear of some kind. Almost all freshwater fishing involves wading in the river or lake, and even saltwater charterboat fishing trips require waterproof footwear. For boat-based fishing or sightseeing, consider a pair of rubber knee boots. On fishing or hunting trips, go with either hip waders or chest waders. Day hikes can be accomplished with a simple day pack that contains your water bottle, some snack items, your map, a compass and a GPS, a camera, and some light first aid supplies. But extended trips require a backpack. On backpack trips into remote country either an internal-frame or an external-frame pack will work. But on hunting trips, an external frame pack is a better option. The pack is heavier, but it has a back band to keep you ventilated and cooled off, and the external frame is much stronger. This is essential for packing heavy loads (moose quarters can weigh well in excess of 150 pounds). A simple pack frame can work well for packing meat, however it is very important that it is very strong and has an excellent strap support system. If you're RV camping, most any sleeping bag will do. But on remote fly-in or backpack trips you need something designed for more demanding conditions. On such trips plan on the bag getting wet. So avoid materials that retain moisture; cotton-lined bags, or bags with down fill can actually be dangerous in remote locations because they are almost impossible to dry in field conditions. Inexperienced campers might not know how important a sleeping pad is, but on their first cold night in the field, they will figure it out quickly. Available options include closed-cell pads, self-inflating pads, and air mattresses. Which one you choose depends on the kind of trip you're taking. On backpack trips most folks favor the self-inflating pads or the closed-cell pads. The air mattresses and so-called "air beds" are best suited for RV camping or for staying in a remote cabin, where backpacking is not necessary. Some campers prefer the comfort of a cot. Some are designed for pack trips, while others are heavier and better suited for campground use or cabin camping. Try your cot out at home before using it in the field, to ensure that you know how to assemble it, and that there are no cross-bars in the way of your head or feet. Community gear includes items commonly shared between group members. Some of this can be very expensive and if you are coming from outside Alaska you have the additional cost of shipping it to, within and from the state. If you're budget is tight, consider renting some of this equipment locally. Some air charter services rent gear, and rental outfits exist in many towns and villages in Alaska. Innovation is the key when it comes to outdoor gear development, and nowhere is this more evident than in the latest variety of camp stoves. But sometimes the old standbys are the best, or perhaps a new spin on an old way. For many Alaska trips, folks have switched from Coleman® white gas camp stoves to propane. The propane stoves are lighter and more reliable, with less replaceable parts. The downside is that propane doesn't flow very well at lower temperatures. Liquid-fuel stoves. These may burn white gas, diesel, AVGAS, automobile fuel, alcohol or all of the above. There are many designs, but you might consider the versatility of a multi-fuel stove, which allows you to use whatever liquid fuel you can find. The MSR XGK is an excellent multi-fuel stove for Alaska and would be a great choice. Keep in mind that full fuel bottles cannot be shipped on the airlines, nor can empty bottles that have a fuel smell in them. Empty the bottle before transport, and swill some diesel or alcohol around inside, to cut the fuel smell. Leave the bottle open for a few days, to dry, and the fuel odor should dissipate. If not, you may have to abandon the canister at the air charter and pick up a new one when you return home. Isobutane stoves. Relatively new on the market, and made famous by the Jet Boil brand, these stoves are very popular in Alaska and the Lower 48. The biggest issue with them, however, is the fuel canister itself. The original Jet Boil canister did not carry the DOT markings necessary for it to travel by commercial air, therefore you are not allowed to ship the canisters to, from or within Alaska. Jet Boil resolved the issue, however many Alaska Bush carriers (air charters) still prohibit the canisters on their aircraft. 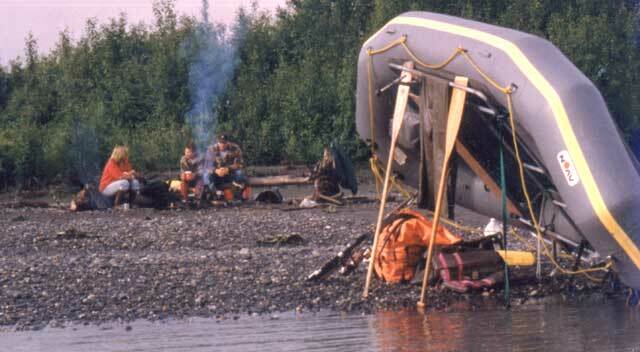 In short, you will not be able to take your Jet Boil on flyout trips in Alaska. Propane stoves. Though somewhat bulky, some folks use the Coleman® one-burner propane stoves for remote trips. They're convenient and the canisters are readily available in many places, including the Bush villages. As was mentioned previously, the down side of propane is that it does not flow well at low temperatures. For summer camping, they're fine, but be cautious with them on fall hunting trips. Wood-burning backpack stoves. Yes, wood burners are here! The biggest challenge faced by those using liquid fuel or compressed gas stoves is the transport of the fuel and fuel containers. It has to be shipped as cargo, and most cargo carriers require shipping in original factory cartons and a fairly substantial HAZMAT fee up front. The work-around is to use a wood-burning backpack stove, where the fuel is the sticks you gather off the ground. It's natural, it's environmentally friendly, it's easy and effective, it can be shipped in your backpack without any restrictions, and it keeps the bugs at bay! Check out our review of the Kelly Kettle in our Gear Review section for more details. Any overnight trip in Alaska (with the exception of RV trips, car camping and cabin camping) require some kind of shelter from the elements. And keep in mind that the term "elements" is not just rain, snow and wind. Alaska's mosquito situation is legendary. Whatever you use, a good mosquito netting is very important. The configuration of your shelter is partly a matter of personal preference, however some principles to take into account are: 1) wind resistance, 2) water resistance, 3) structural integrity 4) weight, 5) color, and 6) interior space and amenities. In addition to your tent, consider bringing along a floorless screen tent for cooking, some extra tarps and parachute cord, and possibly a gear tent to keep your food and gear dry and contained. Need detailed info? CLICK HERE for additional information on the various options, rigging, and setup issues. Many Alaska trips involve getting out on the water. On saltwater flyout trips you might consider a Zodiac-style sportboat or an inflatable canoe or sea kayak. These boats break down into a small package that can be loaded into the cabin of a Bush plane with relative ease. You will need oars or an outboard for the sportboat, and most rental outfits in Alaska don't rent outboards. You'll have to bring your own. Lake trips could involve an inflatable canoe or kayak, or possibly a small cataraft or round boat. If you're fishing, bring along a set of oars or a small electric trolling motor / outboard so you can access the better areas. River trips give you lots of options; look for a quality round boat or cataraft that was built by a reputable company. You may have to repair the boat in the field, so review the process well in advance so you won't be blind-sided in an emergency. Some air charter companies rent boats, and there are several rental shops in Alaska that offer quality boats and accessories for your float trip. Check everything in advance so you don't end up with a leaker or an incomplete raft package that's missing an oar or a pump. Need more info? CLICK HERE for our detailed page on Inflatable Boats, which includes information on materials, construction, designs, pros and cons of various styles, and a complete user's guide.